Retailer Design Within Reach helped create a new appreciation for the modernist aesthetic. With design more mainstream than ever, why is the company in such dire straits? The Wigan Garden Spade is a thing of verdant beauty. Its hunter-green steel and sunny ash-wood handle evoke the pastoral fantasias of an aspiring gentleman farmer — a dwarf maple in your yard, perhaps, around the base of which you can, with Wigan in hand and Wellies on feet, conquer weeds and plant petunias. It’s got history too: Smithies have been handcrafting tools at the same Lancashire forge since King George III sat madly on England’s throne. Thanks to Design Within Reach, it can be yours for the queenly sum of $95. Or it could be mine: I now want one, and I don’t have a yard or even a potted plant. It’s that combination of storytelling and compelling design that has propelled DWR from a Web-and-catalog-only startup 10 years ago into a major nationwide home-furnishings brand today. Once upon a time, way back in the 1990s, America was a land of design philistines. Dwell and Domino didn’t exist. On TV, people didn’t trade spaces, nor did straight guys have queer eyes to help them remake their post-frat-boy apartments. Many of us still thought Ray Eames was a man. According to the genesis story of Design Within Reach, it wasn’t really the people’s fault. We just didn’t know. The finer things in life, which the enlightened residents of Europe had come to appreciate over decades of Danish-designed, Italian-made existence, weren’t available to most of us. They were cloistered in showrooms open exclusively “to the trade”; only interior designers could give us the golden keys. Along came a San Francisco-based revolutionary named Rob Forbes. He decided to seize those keys and share them with all of us … who had the money. (The name Design Within Reach was never meant to suggest that we’d all be able to afford the lovely things.) In 1999, he launched a low-overhead business featuring an online store, an email newsletter, and a direct-mail catalog. These were more than just sales tools — they were the three main components of a nationwide introductory course in modernist design. He and his company became educators and tastemakers. The branding was genius and so was the timing. Americans were ready to trade up in all aspects of their lives — from their takeout coffee to their homes to the furnishings inside. DWR rode this wave of consumer spending, splashing onto the stock market in July 2004. After its first day, the market valued the company at $211 million, an optimistic 70 times its 2003 net earnings. Five years later, Design Within Reach’s brand remains strong, but its business is a mess. Once a pioneering online retailer, it looks today more like an old-fashioned brick-and-mortar operation. Its past year has been unequivocally horrible, from hiring investment bankers in February to explore “strategic options” — corporate code for “we’re in trouble” — to closing stores for the first time in its history to voluntarily delisting from the Nasdaq in July to seeing its market cap dip to just $4 million. In August, DWR got a much-needed lifeline $15 million in capital from fund manager Glenn Krevlin’s Glenhill Capital Management, in exchange for 92% of the company. In October, the new leadership fired CEO Ray Brunner, who had presided over a series of failed attempts at renaissance. Before his ouster, Brunner had painted the company’s current woes purely as a product of the economy. But while DWR’s sales did plunge by a quarter in September 2008, this isn’t a story about the recession or even a simple corporate parable about overlarge appetites. The truth that has emerged from months of conversations with company insiders, former employees, design collaborators past and present, and founder Rob Forbes — in his first public comments since breaking his ties with the firm in 2007 — is that DWR has been a victim of its own unintelligent design. It veered from one ill-advised strategy to another, ranging from a craven knockoff program to a baroque pursuit of brand extensions, including an accessories boutique called Tools for Living, where you can buy that Wigan spade. “We want to make DWR great again,” Krevlin says. “We’re doing everything we can.” For a guide of what not to do, he only has to look back at the company’s recent history. Given the depth of its woes, the tool for living that Design Within Reach’s new leadership could really use most is one that it doesn’t yet stock: a huge shovel. Rob Forbes loves creation stories. On a blustery late-summer afternoon in San Francisco, we’re still warming up in a cozy SoMa bar when he learns that gin is my drink of choice. He launches into a spiel about a local distillery called No. 209. “You can smell the spices, the juniper,” he says, and insists that I just have to see its “amazing” and “beautiful” stills. I settle for the next-best thing: I order a No. 209 and tonic. Even when a piece was available, you might wait months for it — under the old model, a sofa wasn’t shipped or even built until you ordered it. One of DWR’s original taglines was “in stock and ready to ship”; you could be sitting on that new piece in two days if you lived in San Francisco, six days on the East Coast. “We played on the desire for immediate gratification,” Forbes explains. “If you really love something, you’d rather have it sooner than later.” This inventory-heavy model wasn’t cheap, but by focusing on Web and catalog sales, the company kept costs manageable. Even as the economy dipped into recession in 2001 and DWR’s dotcom-era peers died off, the company grew. Thanks to its well-designed magazine-like catalogs — Forbes hired the New York firm Pentagram to create the DWR logo — and Forbes’s accompanying email newsletter, “Design Notes,” the company won a following even among those who could not yet afford most of its offerings, and acquired the nickname Design Not Quite Within Reach, a moniker more affectionate than arch. In the spring of 2006, the board replaced Tara Poseley, a former Gap exec who had succeeded Badovinus but lasted only seven months, with Brunner, who had retired just two months before. A no-nonsense coal-miner’s son — as a child, he says, “I was so fussy my dad thought I was gay” — he speaks bluntly and confidently, frequently alluding to things that obviously smart people allude to, including gnosticism, Philip Johnson, and Maslow’s hierarchy of human needs. (A Mensa plaque sat behind his desk.) With a textbook poker face atop a portly body, he has the look and the presence of a dad that you never want to disappoint (or else), and his self-assurance seemed perfect for a company in search of a compass. “His message was right: We were on course and we were chugging ahead,” says one ex-DWR staffer. His honeymoon lasted perhaps six months. Forbes, who had wanted to depart sooner but remained on the board to provide continuity, says that DWR quickly became “the Ray Show.” Brunner unleashed a flurry of moves to restructure the company. He ditched DWR’s in-stock-and-ready-to-ship strategy. He ignored some board members’ entreaties to close underperforming studios and even intensified his focus on the stores at the expense of the Web site, whose production was outsourced. Worried about the strengthening euro, he deemphasized the newer European design that Forbes favored, putting a much greater emphasis on better-known but lower-margin classic designs by modernist greats like the Eameses. He added pieces inspired by his own likes, including a club chair that the company named the “Ray,” based on one that Brunner saw in a Parisian flea market. The company’s finances seemed to improve: 2007 resulted in a revenue peak of $194 million and a small profit, and Brunner says DWR was showing considerable year-over-year financial progress in 2008 — until the economic collapse in the third quarter. “We got hit literally overnight,” he says. Sales from the third quarter of 2008 onward have consistently been about 30% below what they were in previous years. But DWR’s financial reports before the crash reveal that the company was hardly in robust condition. In the second quarter of 2008, DWR’s same-store sales declined 3.2% and the company posted a net loss of $159,000, an improvement from a $575,000 deficit in the same quarter of 2007 — but only because DWR recorded a tax benefit of $541,000 from the previous year’s loss. Sales through DWR.com fell 3.3% in 2007, and in the first half of 2008, they sank 12.3% compared to the first half of 2007. As these challenges accumulated, Brunner slowly transformed Design Within Reach. It became a company that looked less and less like the bold startup that revolutionized the design sector and more and more like the plodding retailers — Eddie Bauer, Gap — where he’d spent so much of his career. The strategy is a disappointing echo of a controversial decision Forbes made shortly after Design Within Reach’s birth. He couldn’t get permission from Knoll to sell Mies van der Rohe’s Barcelona chair, and so DWR did an “inspired by” piece, to the original specs, called the Pavilion. Forbes emphasizes that DWR never tried to pass the Pavilion off as the Mies original, but still squirms and stutters over the decision to sell it. “I didn’t feel that good about it… . It bugged me … because … as a designer …” He trails off and finally continues. “Yes, it’s legal to sell those things, but it’s how you go about doing it. We all have our instincts about what you can live with. Some people are happy with breast implants and some aren’t.” Knoll finally allowed DWR to sell the Barcelona chair in 2005. Two companies have filed suit against DWR for trademark infringement. 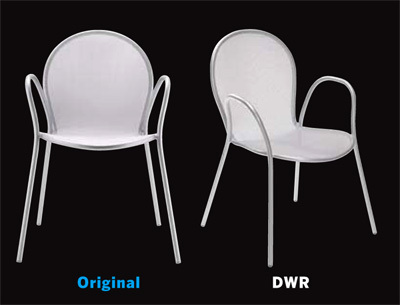 The New York furniture manufacturer Heller claims that DWR sells a knockoff of its Bellini chair, a well-known piece by Italian designer Mario Bellini. 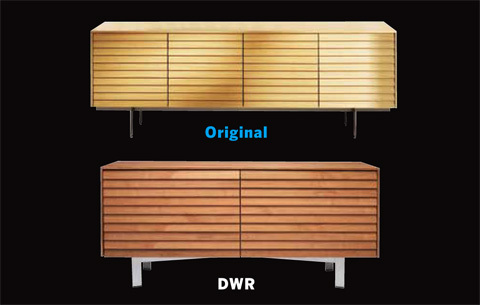 It has not gone unnoticed by industry observers that DWR’s version is called the Alonzo ($88). “It’s a middle finger to me,” says Heller CEO Alan Heller, who was an original investor in DWR. Brunner denies that the names “Alan Heller” and “Alonzo” are related. The Minneapolis-based design company Blu Dot sued DWR for the alleged knockoff of its Strut table, claiming that DWR even used a photo of the Strut to advertise its version, called the Metric. “Do they think that no one will notice?” says Blu Dot CEO John Christakos. DWR subsequently stopped production of the Metric (“quality issues,” a spokeswoman said), and Blu Dot decided in late October to drop the suit. On a warm September evening, DWR’s Tools for Living store in New York’s Soho is packed with hipsters — thick-framed eyeglasses; skinny ties; business cards with titles like “stylist,” “designer,” and “architect”; lots and lots and lots of black clothing. It’s the store’s first birthday party, and so the guests — invited via DWR’s email newsletter — are nibbling on appropriately mini cupcakes and sipping pink champagne. House music pumps softly from Geneva Sound System speakers ($979), which look like giant Legos, and with its light hardwood floors, high ceilings, and artfully spaced merchandise, the place feels like an Apple Store for housewares. This kind of consumer takeaway has been incredibly heartening to the DWR team, because hopes for Tools for Living aren’t just high — they’re huge. “We’re looking at Tools for Living as the growth engine for the company,” says Sally Yang, who runs the unit. In fiscal 2008, Tools for Living — with just two stores, one in Manhattan and one in Santa Monica, California — contributed 5% of the company’s sales. (A third store has since opened in Newport Beach, California.) According to Brunner and Yang, the numbers have beaten their internal projections handily, especially given that the unit is, to use Yang’s terminology, “still a toddler.” DWR is now drawing up plans to open more Tools for Living stores; on December 2, it will create 20 pop-up shops in markets across the country as a test. Brunner also launched two other offshoots, DWR Bath and DWR Kitchen, which he told me were ahead of plan. His comment suggests that “plan” was extraordinarily conservative, given that only one person purchased a DWR kitchen in 2009. Three weeks after Brunner laid out this vision, the fat lady throat-sang for him: He was out as CEO. This is as true for a company as it is for a chair. DWR was designed to make money largely by educating America about modernism — its visual appeal, its unique stories, its integrity — and making prime examples of that design available quickly. These were its core competitive advantages. Under Brunner, many thought that the company had changed so much — moved so far away from its original principles — that it no longer did what it was made for. Brunner’s exit was a “draconian move,” Krevlin says, but one that was necessary to “reestablish the company’s DNA.” Though a new CEO for DWR had not been named as of press time, DWR Kitchen was quickly axed. Krevlin adds that DWR’s new leadership is starting with two key initiatives. First, the company’s original in-stock-and-ready-to-ship policy will return for core items in the catalog. Second, it will “reestablish strong relationships with the design community,” Krevlin says. DWR’s team is spending a lot of time talking with designers and vendors — “If there are people who are particularly pissed at us, I would like their names and phone numbers,” he says — and the company is discontinuing products that could be considered knockoffs. All the drama of DWR’s last few months makes me think of a print that Brunner had hanging behind his office door, across from a white Panton chair ($260) signed by Anna Nicole Smith (priceless). Created by the Brooklyn-based graphic designer James Victore, the image features a silhouette of a cowboy on horseback, riding off into the sunset. It’s a curious piece, and tucked in that corner, it felt like a prophecy. Indeed, the words the end are splashed boldly across the scene. Reading them, I couldn’t help but wonder at the time: His? The company’s? For the moment, we have our answer. Correction: In the original article we misidentified the designer of the Bellini chair.